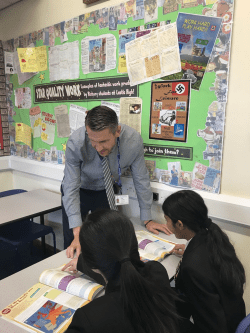 It’s the issue in KS3 that won’t seem to go away – how do we accurately (and simply) assess what students know and can do at KS3, and what does ‘progression’ look like in History? I know for a fact that teachers have tirelessly grappled with these questions, and probably tried all sorts of different assessment models, in an attempt to measure progress without levels. Indeed, there are a number of ‘off the shelf’ assessment models out there at the moment but, in my opinion, many of these seem overly complicated. I think I would spend more time trying to negotiate the different tabs and filling in spreadsheets than actually teaching the History and marking the students’ work! In the Third Editions of OUP’s KS3 History series we included a number of assessments in each of the four Student Books and corresponding Kerboodles (there are twelve in total – three in each book). These assessments aimed to pick up on some of the content within the Student Books that the students will have studied, but also to focus on the History skills and concepts highlighted in the National Curriculum, and that are now also required in the new GCSE examinations. For example, in Industry, Invention and Empire, assessments cover source analysis and the second order concept of significance. And in Technology, War and Independence the final assessment focuses on how and why Margaret Thatcher will be remembered in different ways (a timely introduction to the ‘interpretation question’ demands of the new GCSE). Each of the assessments and marking criteria are underpinned by Oxford’s ‘Developing, Secure, Extending’ assessment bands, devised by assessment expert Dr Andy Chandler-Grevatt. In recent months I’ve been working with Oxford to develop the original assessment model further. Many teachers have told us that they are spending a lot of time mapping out how their current assessments can help measure progress towards the new GCSEs. So, using the brilliant guidance for History departments put together by NFER in conjunction with ASCL and SSAT (and lots of schools), we have revised the skills descriptors to match the latest understanding of the new GCSEs. Further, we are producing a series of new KS3 assessments that link to the Student Book topics and are mapped to the new GCSEs as well. Each assessment has been developed and reviewed by History experts (including Mike Maddison and Steve Day), so you can trust that the materials will help you deliver robust assessments that are straightforward to use in your classrooms. These are all available for free as part of the subscription to the KS3 History Kerboodles. The new assessment resources mean that you can continue to use the Student Book assessments (they are still valid assessments) but you can also start to use the new assessments that are not only mapped to the skills and concepts that we want to see our students develop, but also fine-tuned to match the demands of the new GCSEs. For example, the new assessment titled In what ways did towns changes in the 1800s? focuses primarily on the History skill of change of continuity, and all strands of the change and continuity success criteria are assessed (relevant strands of knowledge and understanding success criteria are assessed, too). The assessments are differentiated and the tasks are designed so that all students (whether they are aiming for Developing, Secure or Extending) can demonstrate their progress. The package also includes self-assessment checklists, presentations, detailed teacher notes to help you deliver the new assessments, and information to help keep track of student progress. We have also worked hard to ensure that the ‘recording’ element is as streamlined as possible. As the new model has been developed by teachers for teachers, it was important to make the assessments easy to use and a match with the KS3 course you’re already following in your school. The assessments seamlessly integrate with your existing resources and schemes of learning. The assessment resources themselves, and the tracking documentation, will be available on the Kerboodle platform, making it easy for teachers to administer the assessments and track students’ progress from Year 7 to Year 9. Topic: Join expert history consultant Steve Day and me at our FREE KS3 assessment webinar called Getting to grips with KS3 History Assessment this term. Details: We’ll share best practice about History assessment, discuss what our new KS3 assessments are like, and offer help and advice to ensure clear progression towards GCSE for all your students. When? Monday 13 November, 4:30-5:00 pm. Everyone who registers will also be sent a recording, in case you can’t make it on the day. We would love to hear how you’re assessing progress in your school, and whether you are finding the new assessment resources (free to Kerboodle subscribers) in our KS3 History Kerboodles helpful in tracking student progress. 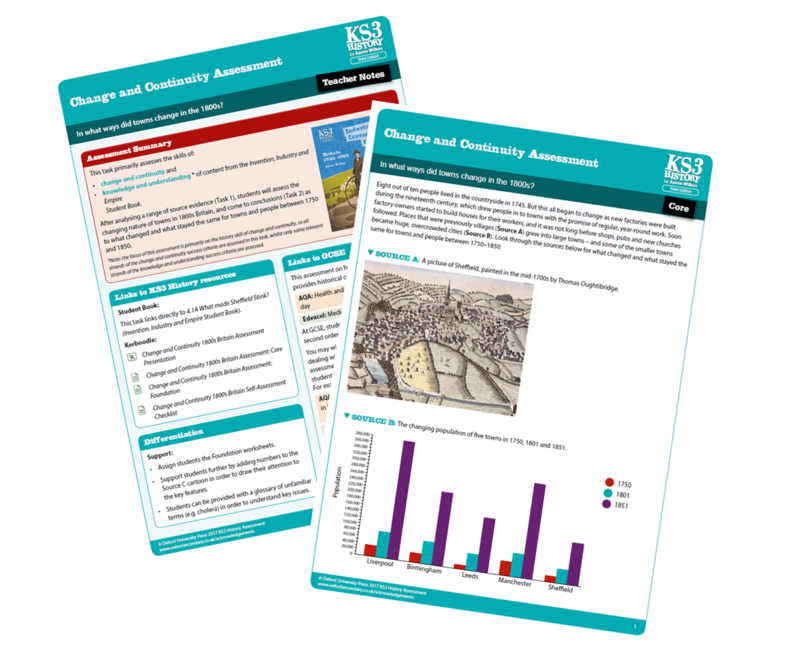 Email us at Georgina.White@oup.com or tweet us at OxfordEdHistory using the #KS3Assessment hashtag. Aaron Wilkes is a leading History author in school publishing and Head of History at Castle High School, Dudley. ← How to write your best SCARY story!